Maine’s got its big, click meaty lobsters. The kind of lobsters so full of meat, buy that it’s best eaten with a bib and a bowl of melted butter. The kind of lobster that’s a meal unto itself. Here in Florida, therapy we’ve got much smaller lobsters hanging out in the warm water. The Spiny (or Florida or Caribbean) lobster doesn’t have the big ol’ claws the Maine lobster has, and most of its meat is found in the tail. It’s not really the kind of lobster you steam and eat with butter. Florida lobster tails can be grilled (delicious), sauteed or made into a delicious pasta sauce. Lobster at my parents house usually finds its way into a chunky, garlicky, tomato-y Cuban sauce — Enchilado. Enchilado can be made with lobster or shrimp, or a combination of both. 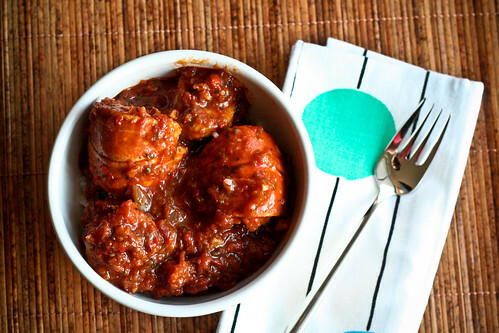 Its rich and flavorful sauce is easy to make and impressively good. It’s also the best-ever sauce for sopping up with bread. We usually serve it over white rice, but would also be good with pasta. Either way, it’s an especially tasty way to kick off the Holiday week. Nothing says celebration more than lobster! Although a bit annoying once it gets to the plate, you definitely want to leave the shells on the lobster tails. It gives the sauce a much deeper flavor. Go ahead and de-tail the shrimp. You don’t want to fight with your food too long before you dig in. Cut lobster tails into 3 rings. Place a large pot over medium heat. When it’s hot, add the olive oil, shrimp and lobster rings. Saute until the shrimp turn opaque and the lobster shells turn bright red, about 5 minutes. Remove to a bowl with a slotted spoon and set aside. Saute the onions, garlic, red pepper and bay leaf in the remaining oil for about 10 minutes, or until the onions are completely translucent and soft. Stir in the tomato paste, crushed tomatoes, ketchup, parsley, Wocestershire sauce, white wine, vinegar and pimentos. Bring to a steady simmer, about 15 minutes. Add salt and pepper to taste. Return the seafood to the pot and simmer uncovered for 15 – 20 minutes. You want to make sure not to overcook the seafood or it will be tough. Stir in your desired amount of hot sauce. Serve immediately with white rice and a big loaf of bread to sop up the sauce. Hooray for Florida cooking! This sounds like a fantastic recipe, and kudos on the photo, too. 1 million times over…this is a winner! This dish is absolutely gorgeous! Definitely mouthwatering! Yum! I love seeing the family holiday recipes of different bloggers from different parts of the country…I’ve never had Spiny lobster! I used to date a Cuban man in Miami whose dad was a professional lobsterman in the keys. His mom made this dish regularly, using fresh lobster just caught in the warm, clear waters. It is my favorite thing I have ever eaten. I’ve tried to find the recipe for years, but none of them hit the mark. I think I’ve finally found the right formula here, and I can’t wait to experience this taste again! This was one of my son’s favorite dishes. I have never tried it as his Cuban grandmother who has since left us was the quintessential expert of enchilado langosta. But as Christmas is about memories, I am going to try to make one, and this recipe sounds perfect. When I lived in Key West during the 1930s (all of them), we crawfished several times per week (you refer to crawfish as spiney florida lobster). My mother used Cuban friends’s recipes to make what we called Crawfish Cheelau (chee lauw?) – not sure of the spelling. Can you help with such a recipe or is that what you’ve just described? I know the recipe was not complex because during the depression there was little food to waste and often not enough to go around twice. I loved Cheelau (?) with rice expecially with real cuban bread for sopping. Help! Hi Maurice – Enchilado is pronounced “en chee lao”, so I’m sure it’s the same dish, or a very similar recipe. This one is a definitely a classic that my grandmothers and great-grandmothers grew up making. Does it look similar?